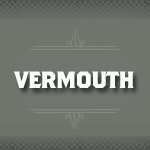 Vermouth is a fortified wine flavored with botanicals such as roots, seeds, and herbs. Traditionally used as a medicine it is most famous as an aperitif and also found a use in numerous cocktails and also as a replacement for white wine in cooking. The two main types of vermouth are dry and sweet, although variations of those two are now found.